PLANS to build a prestigious new multi-million pound links course on the west coast of Scotland close to Turnberry, Prestwick and Troon have taken a major step forward. The Ayrshire Golf Company has completed negotiations with Irvine Bay Regeneration Company to construct a new 18-hole links course complete with adjoining hotel and a selection of fraction-freehold holiday homes next to the existing Dundonald golf course at Western Gailes. Construction of the par 71 golf course and hotel facility with clubhouse, professionals shop, spa, restaurant and conference facilities is now expected to start next year (2010) and should see the creation of around 250 construction jobs once final planning permission has been obtained from North Ayrshire Council. The £60million project, known as The Ayrshire, will be overseen by the same team who were responsible for what has been dubbed the world’s most environmentally friendly golf course, Machrihanish Dunes. “The project is very exciting, it’s the newest links course on the west coast of Scotland,” said Brian Keating, director of The Ayrshire and founder/developer of Machrihanish Dunes. “We see the project as a bookend to Turnberry. One of the most exciting things for me is that it is in Ayrshire. A lot of people forget that while St Andrews is the spiritual soul of golf Ayrshire is definitely the heart of golf. At Machrihanish Dunes developers worked closely with ecologists and Scottish Natural Heritage (SNH) to ensure the handmade course caused as little environmental disturbance as possible. The course was redesigned to avoid several rare plants and other sensitive wildlife while the greens were all cut and laid by hand. Even the rough was managed by a breed of rare Hebridean sheep instead of using a lawnmower. “The Ayrshire site isn’t as environmentally sensitive as Machrihanish Dunes but it will still be a major consideration.” said Mr Keating. “We will redevelop the land, which has had an assortment of industrial uses, and try to take it back to how it probably looked 150 years ago, as well as carefully restoring any damage that has occurred on the SSSI fringe of the site. On completion The Ayrshire will require the staffing of around 90 full time and 45 part time jobs ranging from green keeping staff to bar tenders, caddies and hotel managers. “It is important for us to make The Ayrshire a pay to play course so that it is accessible to as many people as possible and not just another private members course“, said Mr Keating. “The course backs onto Irvine, so visitors will be able to walk right into the centre of the town. If we can bring thousands of guests from across the UK and abroad to a hotel within walking distance of the central shopping precinct in Irvine there will be opportunities for everyone in the local community to benefit. It’s been estimated by the developers that around 25,000 rounds of golf a year will be played at The Ayrshire. If each golfer spends £200 locally, then the annual benefit to the economy will be £5million. “We are delighted to get this agreement in place, and that we can hopefully see work begin on site next year,” said Patrick Wiggins, chief executive of Irvine Bay. “The Ayrshire is one of our flagship projects and we expect it to play a significant role. Not only will it create jobs and wealth and improve the environment and appeal of the area, it also sends out a strong signal that dynamic development is alive and well in this part of the country, and that something very positive is happening in Irvine Bay. The creation of The Ayrshire has been welcomed by the Links Association, the international body that campaigns on behalf of links golf. 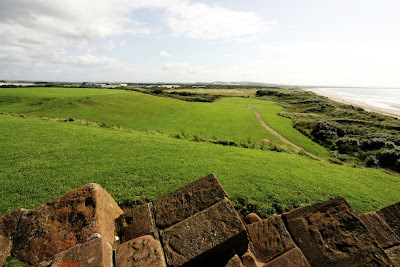 “The announcement of a new links golf course for Ayrshire is not only good news for the region but also for the future of sustainable golf,” said Malcolm Campbell, chief executive of the Links Association. “Traditional links golf is the model for responsible golf development in the future. Brian Keating proved at Machrihanish Dunes that golf and ecological and environmental interests can work successfully together for the good of the community. There are currently 620 Ayrshire business stories permanently archived on this site. To locate those of most interest to you, please use the site search facility in the top left hand corner of this page. Type your search term in the white box, then click the magnifying glass symbol. I think it would be a great resort, Thanks for the nice post and information. Couple of months back I visited South Africa for a nice golf vacation. I played at River Club, it is located in beautiful place and have experienced staff. Another advantage with them is the low green fees, Enjoy!